Two forces driving B2B change are clear. First, continuous innovation to enhance, differentiate and revolutionize products and solutions is the primary way that B2B enterprises compete effectively. 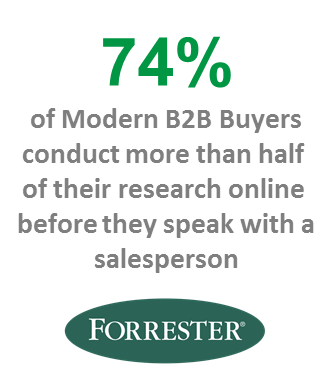 Second, B2B buyers require less and later direct interaction with sales reps because they have more information available to them online. The result: achieving B2B sales results has become more demanding. Sales cycles have lengthened with the erosion of simplicity. Conversion rates have faded. Deals when closed are often less profitable. The tectonic plates of sales strategy are shifting in ways that address these challenges. The first shift is toward increasing specialization within sales teams by adding and including “presales” professionals in the sales process. Specialization makes it possible to supplement the knowledge and experience base of the sales team to address Complexity and to help build Customer Consensus. The second shift is toward increasing customization of products, solutions and sales content to the specifics of the customer. Customization of content facilitates faster and stronger Customer Connection by supporting sales conversations that address customer-specific problems and concerns. Customization of products and solutions combats commoditization, becoming a means to increase the profitability of innovation based on specific customer needs while creating buyer motivation to connect with sellers earlier in the buying process. Sales Specialization & the Role of Presales. As members of a sales team, presales professionals, by definition, engage directly with customers prior to the closing of a sale. “Presales” roles are attached to many job titles. For some presales professionals, e.g. product managers, their presales role may be a part-time, hands-on way to assess and improve the overall effectiveness of the way their product is sold. Presales can also be a part-time job for customer-facing members of teams who stay involved with customers post-sale. The rest of their job description includes roles such as customer success management, onboarding and implementation project management. But for many presales professionals, their presales role is a full-time job integrated into the normal sales process for some or all target accounts. In these situations, presales will usually hand off to a separate customer success or implementation team as the deal closes. tailor a package or solution to customer specifics. Customization of Content & Solutions. In some businesses, customization has been a way of life for years. Strategic consultants, creative advertising agencies, M & A advisors, corporate law firms and custom software developers tailor their products, solutions and services extensively to their clients/customers and target accounts. Their sales conversations and pitches tend to be highly specific to the account and this specificity continues into the execution of their projects. For the broader, differentiated B2B universe, customization may not be a cornerstone business strategy, but it is increasingly important in several dimensions. The first dimension involves adapting and tailoring content and conversations to more specific customer understanding. The internet supports sales teams in this customization, making information readily and efficiently available about customer business, products, organization, individuals, strategy and challenges. Call prep, proposals and content are more easily customized with improved sales enablement technology. Conversations can be planned to focus more deliberately on business problems and topics that will resonate with key customer contacts. The second dimension is customized solutions. Tailoring product-like offerings to target different segments (e.g. gold, silver, bronze), customized packages of components and customized one-off solutions are all approaches that help differentiate an offering in a way that fits the customer, engages the customer and makes simple price comparisons more challenging for buyers. 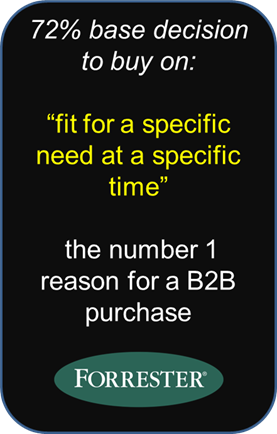 Finally, making the connection between customer-specific intelligence and customer-specific solutions targets the number one reason for a B2B purchase: the fit of a solution to a customer. The result is to transform transactional conversations into collaborative conversations about the best fit to the specific needs of that account. Highlighting specific customer outcomes, focusing on customer value created and building a common business case are all part of building a relationship with customer stakeholders where members of a sales team become trusted advisors to the customer. Specialization and Customization Together. 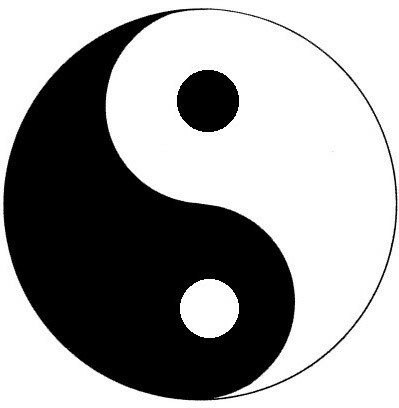 Sales specialization and customization are an almost inseparable yin and yang. By augmenting the sales team with expertise and bandwidth, presales professionals often make customization of content and solutions possible. But as customization is layered into solutions and sales processes, complexity increases, creating an ever-increasing need for better and more efficient deployment of presales specialists. Customization and specialization, taken together, raise the stakes. They are both expensive and difficult to execute. The best presales professionals are hard to find. Organizations, by design, often choose to make presales a scarce resource. Customization usually raises the bar for successful delivery in the eye of the customer and invariably increases the cost to serve target accounts and acquired customers. In previous blogs we have looked at the challenges of presales and at maximizing presales effectiveness without reference to specific presales roles and responsibilities. In those blogs, we explored best practices that improve the success of deploying presales across a variety of business circumstances. (ii) the customization of content and solutions related to that focus. Sales Focus: Products and Solutions. Every sales team has a focus that drives how sales and presales time are spent on different possible products or solutions that they can sell. Often this choice is driven by the way that a business unit is structured. For a single product startup there is only one possible choice: sales sells the company’s single product. Some businesses have their new account reps concentrate primarily on one product or solution as a natural entry point for a new account. In some industries (e.g. pharma and medical devices) the design of a sales group is often that sales spends disproportionate time and energy on one or two new products being launched. The product/ solution portfolio covered by sales begins to extend beyond single product sales into multiple product and/or services packages (perhaps mutually exclusive choices) for any customer to buy. Customer segmentation is a classic driver for this approach (e.g. gold, silver, bronze offerings). 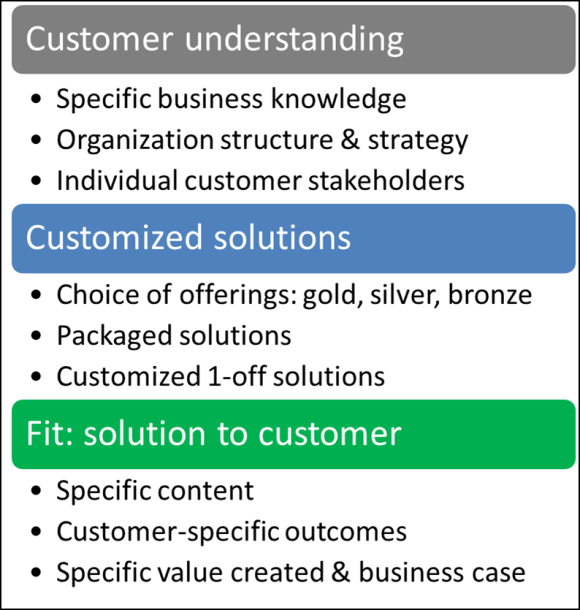 Segmentation can be based on customer need, customer industry and customer value. Implementation specifics for some solutions also drive customization as design, deployment planning and engineering are necessary to a successful implementation. The buyer choices involved in selecting between alternative offerings add a layer of complexity that is usually best addressed by presales professionals. A multiproduct approach to sales is common in many enterprises, given the breadth of their platform and offerings. Multiproduct responsibility is typical for an account executive with a base of existing accounts and current customers. Here the sales objective is usually a combination of account retention and upselling additional opportunities to the account. Sometimes products from the platform are sold one product at a time. 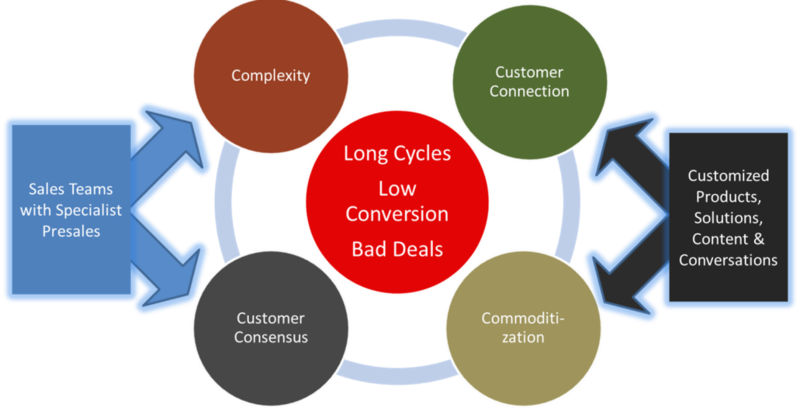 Sometimes solutions are sold as a package (or a bundle) of several products at a time. Multiple product focus is a way to scale account management but always adds to the complexity of the account executive’s job. This creates a natural role for presales. Finally there are custom solutions, where something different is being sold to each customer every time. These are often big ticket, long cycle B2B sales and have the expected complexity of detailed and extensive configuration of a solution to each customer. Solutions that are truly custom (as opposed to a package of replicable products or modules) have the twin challenges of having a high cost to serve and of being unscalable in how they add revenues to a growing business. Related Customization of Content and Solutions. Across the spectrum of products and offerings, the customization responsibilities of presales professionals start to differ depending on the sales strategy. Often these differences are blurry but patterns are sometimes reflected in presales job titles. Product Managers or Business Development specialists may be focused primarily on providing customers with in-depth technical and product details, sometimes without an explicit mission to customize content to the specifics of accounts. Given a narrow product focus, this organizational approach is useful for single product and simple package sales as well as for multiproduct platform sales where the rep sells a product at a time, a la carte. That said, the best Product Managers typically go beyond cookie-cutter product information and canned presentations to customizing content and including customer specifics in their proposals and discussions. At that point their role often blurs with that of Subject Matter Experts (SMEs) or Technical Sales who often have a more explicit mandate to understand and adapt to customer specifics. For SMEs and Technical Sales, customization becomes integral to their additional presales responsibility of providing practical use and implementation experience relevant to the specific situation of the customer. This is often mission-critical for a new product where customization of content and conversations provides credibility, building customer confidence that a new product will deliver for an account with specific challenges and opportunities. Taking newer products beyond beta customers and early customers requires scalable expertise and practical experience even for a homogeneous offering. This is a common situation for a drug or a medical device launch. When distinct packages of replicable product(s), including services, become the primary emphasis of a focused-product sales strategy, the nature of customization responsibility changes, often in parallel with a shift in job title to Solution Consultant or Sales Engineer. At this point, the presales professional is expected to customize a solution for the account in addition to providing technical expertise and relevant experience from other account situations. The same is true for a multiproduct strategy where Solution Consultants have a role in choosing the best product or package of products to fit an existing account situation. For one-off custom solutions, the presales title sometimes shifts again toward something like “Solution Architect” where solution design becomes a central part of the presales job description. For custom solutions, the Solution Architect often quarterbacks a project from relatively early in the sales cycle to a point at least partway into the implementation phase. Making custom solutions replicable or “productizing” them. Across the spectrum of strategies, and regardless of any dynamics, more efficient customization of content to enhance customer connection is becoming a fundamental requirement for sales teams to succeed in the face of competition and enhanced buyer information. A Shared Value Proposition builds organizational collaboration that helps B2B sales teams win. Value Propositions address sales challenges throughout the B2B sales cycle. They are useful early in the sales cycle in call preparation, in qualifying opportunities and in engaging customer executives. They become an important focal point for a seamless transition to include presales in dialog with an account. Sales and presales together use Value Propositions to communicate bottom-line results, highlight differentiation and cut through complexity as they get account commitment to evaluate our solution. In the evaluation phase, Value Propositions are a framework for customer diligence, handling objections and building consensus in conversations with multiple stakeholders. Ultimately those Value Propositions are shared with and owned by customer teams as well. A consensus Value Proposition is a useful tool, not just for sales teams, but in the hands of customer sponsors through their own approval processes, as they make the internal business case for buying our solution at a fair price and shepherd documents through to finalization. Ultimately, Value Propositions become a basis for trust and collaboration with customers. Very good article. I try to get the client to tell me what they need for the long term. Having long term clientele more often than not can result in a referral down the line. Thanks again for the information. Thanks for the strategies you have discussed here. In addition, I believe there are a few factors which keep your automobile insurance premium lower. One is, to bear in mind buying cars and trucks that are in the good list of car insurance organizations. Cars which are expensive tend to be at risk of being stolen. Aside from that insurance is also based on the value of the car, so the more costly it is, then higher your premium you only pay.